In this example, the Frequency cellvalue is changed to COMMA12; and the Percent, RowPercent, and ColPercent cellvalues are changed to 6.3. Create the user-defined formats and the data set. The FORMAT procedure creates four user-defined formats that can be used in the crosstabulation template. The DATA step creates the Gov data set. Establish the ODS path. The ODS PATH statement specifies the locations to write to or read from when creating the PROC TEMPLATE templates. The ODS NOPROCTITLE statement suppresses the title of the FREQ procedure. Base.Freq.CrossTabFreqs that was created in Creating a Crosstabulation Table Template with a Customized Legend. Apply new formats to the cellvalues Frequency, Percent, RowPercent, and ColPercent. 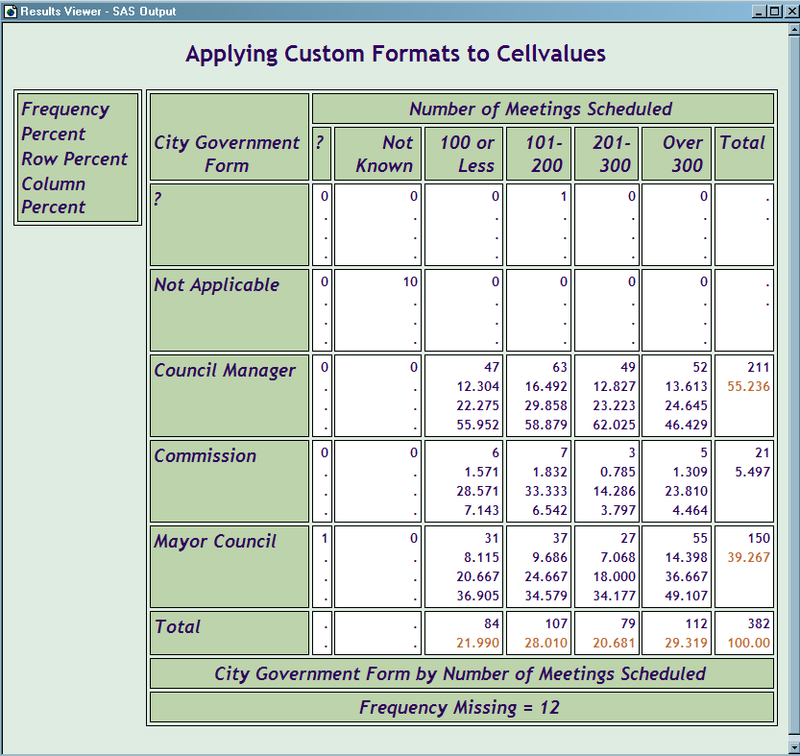 The FORMAT= attribute specifies a format for the cellvalues. The format COMMA12. is applied to Frequency, and the format 6.3 is applied to Percent, RowPercent, and ColPercent. Create the HTML output and specify the name of the HTML file. The ODS HTML statement with the STYLE= option specifies the style template Ocean for the output. Create the crosstabulation table and add a title. The FREQ procedure creates a Citygovt by Robgrp crosstabulation table. The TITLE statement specifies a title.